Tintin Heart: Ditzy-Craftymessers - Colouring with Watercolours etc. Ditzy-Craftymessers - Colouring with Watercolours etc. "Stamp out a floral stamp onto white card using Stazon, Digi images are acceptable, but more difficult...watch your lines. 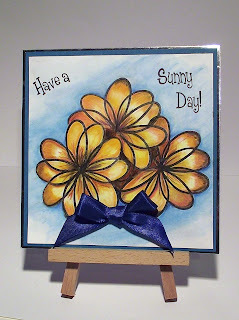 Then using ONLY watercolour pencils, waterbased pens, acrylic watercolour paints, colour in the image, then mount and make..... card/ATC/scrapbook page/bookmark/fat page etc etc"
These are todays instruction the for Ditzy Crafty-Messers Challenge Blog . I haven't used my watercolour pencils for a while so it was nice to dig them out again for this challenge. The 'Daisy' has been stamped three times onto a 12 x 12cm piece of white card with the help of a bit of masking. I've used some Faber Castel water-colour pencils to do the colouring and tried to create a bit of light and shadow with the limited colours I had. The finished image was mounted on the a blue background and then on to a 13 x 13 cm silver cardbase from my stash. The blue ribbon came from some wrapping left-over from christmas. 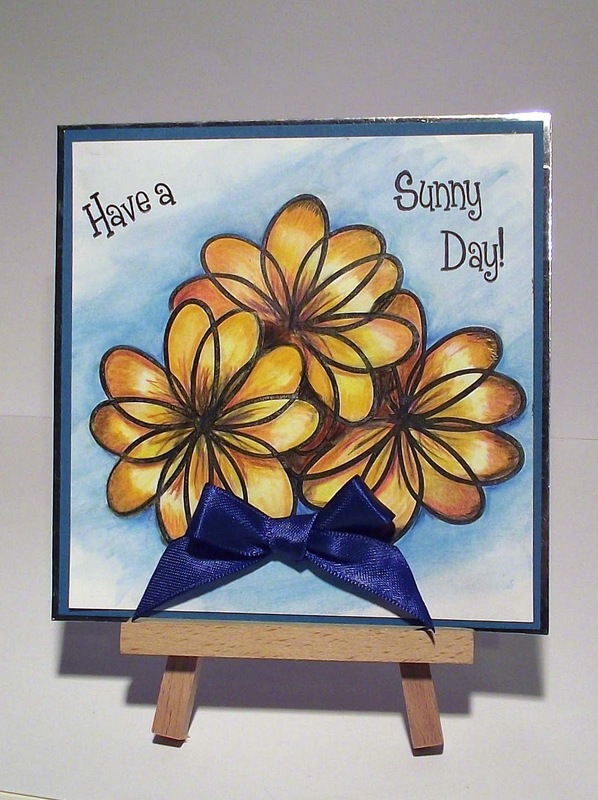 Sentiments and Daisy come from Stamps of Life. Not too bad?! It's gorgeous Angela! I must get out my watercolour pencils - I've neglected them for far too long!